What’s that I hear on the local news? Seventy degree weather coming up?! Yes, please. Spring has finally arrived ladies and gentlemen, and I couldn’t be more joyous. Peace out winter jackets, 5-o’clock sunsets, and Frozen sing-alongs. In simplest terms, bye Felicia and hello sunshine! 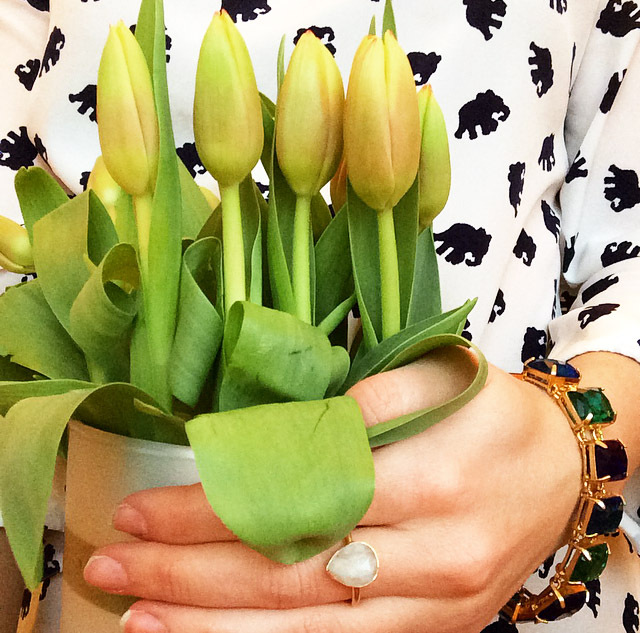 My favorite way to bring spring into my home is with fresh, seasonal flowers. I buy inexpensive flowers at Trader Joe’s and place them into a favorite vase as-is or I create an arrangement of my own (see the how-to here). 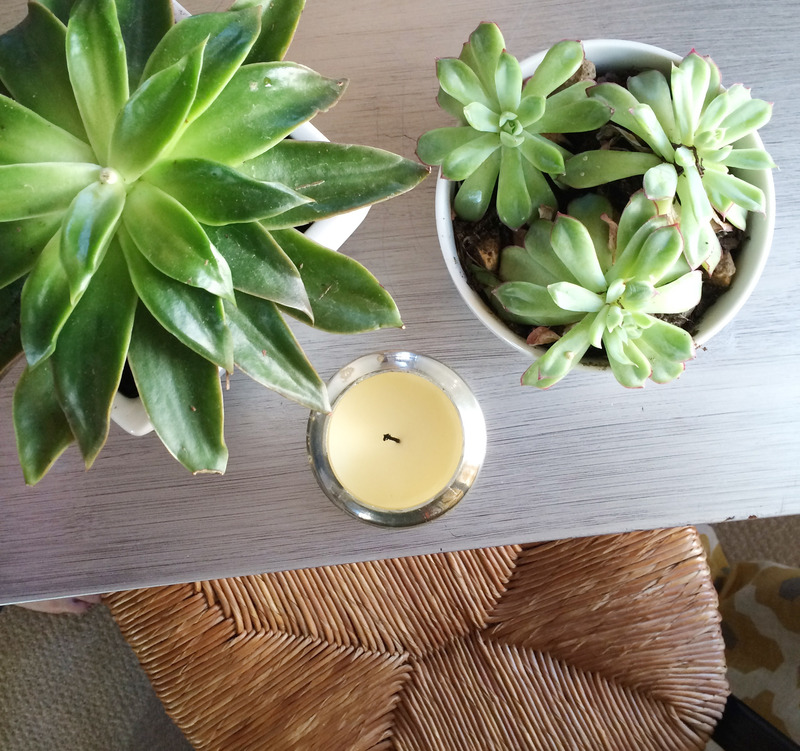 Flowers are a great way to add color and a hint of freshness to a tired winter apartment. Grab a $3.99 bunch and you have an instant centerpiece. Theory #1: Spring flowers need lots of sunlight. False. Spring flowers are cool-weather flowers and should not be placed in direct sunlight. In fact, most flowers will bloom and die quicker in a warm space than a cool one. If you want your flowers to last longer (say, until your guests arrive for the weekend) place them in the refrigerator. Theory #2: Cut your stems on an angle. True. Cutting stems on an angle creates a larger surface area, allowing the plant to drink in more water. For thirstier flowers, like hydrangeas, cut up into the stem creating an X and let them drink up! Theory #3: Add sugar, Asprin, or even a penny to your flower’s water. Let’s go with a maybe on this one. My best advice is to change the flower’s water and cut the stem-ends every other day. Don’t just top the water off. You can also use the fertilizer packets provided with most grocery store flowers. Theory #4: Water potted plants everyday. False. I have killed many succulents in my day… I’ve even killed a cactus. How, you ask? Over watering. The amount of water a plant needs depends on the specific plant. Do your research and take notes on your plant’s behavior. Watering volumes also correlate with amount of sunlight and the constant temperature. Theory #5: Keep cut flowers away from fruit. Surprising true. Fruits release a type of gas that causes most cut flowers to age, leading to a quicker wilt. Wishing all my followers a lucky green thumb and a happy spring! Great tips. Thank you. I didn’t know about not having plants near fruit. Great tips! Can’t wait to pick flowers from our garden again.